Reading is one of the most fantastic pastimes that you can ever introduce to your child. In fact, even in the current age of advanced smartphones, video games, and high-definition television, millions of children continue to read on a daily basis – and they love it! We are big fans of finding new ways to entice your child to read more books. Setting up a reading challenge, for instance, will help improve their engagement and keep them excited about reading. It is important for your children to understand that no matter how great a book’s plot may be, it’s the characters who truly give the story life. Writing a report on (or drawing a picture of a favorite character), whether that person is a hero, like Pete Hollister, or a villain, like Joey Brill, makes a great reading challenge that will teach them how integral characters are to a story. As they say, variety is the spice of life, and that’s definitely the case when it comes to exposing your children to the world of books. Whether you or your child pick the subject, a great reading challenge is one where he or she is introduced to a new subject, such as coin collecting or circus animals – something the child has expressed interest in so he or she can learn more about it. If you want your child to learn something of cultural or historical significance and value, then you should definitely choose a true story for them to read, whether it’s a historical account or biography, or maybe a book that takes place in a new or unusual location. For this reading challenge, give them a short quiz on what they’ve read to ensure that they read it carefully and were able to understand it. Another twist is to have them “teach” you something you might not know. Books are often filled with very specific objects that would make a wonderful gift for your child once he or she has completed a reading challenge. Whether it’s a collectible coin, a hand puppet, or even another book that’s mentioned within the story, this will help your child feel more engaged. Unless the story takes place on another planet, a great reward for completing a reading challenge is to take the child to either a precise location featured in the book or one that represents a similar feel, to a history museum or petting zoo, for example. Once you’ve arrived, you can even have the child tell you about the parts of the story that took place there. Completing a reading challenge gives you the perfect reason to gather up your family and go do something fun together, whether it’s a picnic at the beach or a day at an amusement park. 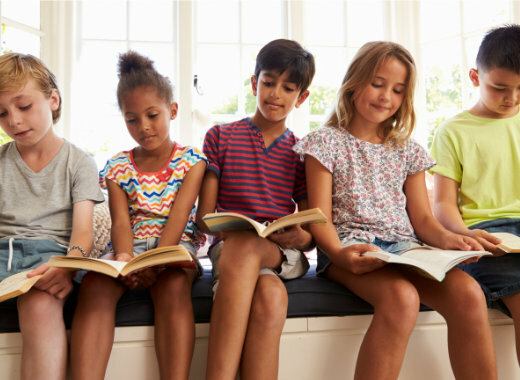 It doesn’t have to integrate anything from the book, but this is a perfect time to talk about what your child read and discuss any issues that specifically interested them. Thanks to the variety of its stories, The Happy Hollisters series is one of the best book collections to have around whenever you want to initiate a new reading challenge. This engaging series of youth mystery novels has been entertaining kids since 1953, with wonderful storytelling by Jerry West (Andrew E. Svenson) and gorgeous illustrations by artist Helen S. Hamilton. They are available in paperback and ebook formats on through our store on Amazon. You can also join the Happy Hollisters Book Club. Are you and your child ready for a reading challenge?